The easiest, most common way to travel to Ambergris Caye is to fly into the Philip Goldson International Airport, outside of Belize City.Â Â But this is often not the most cost effective way to travel back and forth.Â Those of us who live here on the island sometimes opt for taking the speedboat to Chetumal and then heading to Cancun International Airport.Â Some people have a car in Chetumal.Â Most of us just hop on the high end bus to Cancun. 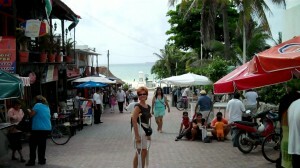 There are a number of reasons to use this alternative travel approach.Â In general, the cost of flights in and out of Cancun is less expensive, since the Mexican government subsidizes them.Â Belize is a very small country and subsidizing flights isnÂt a realistic option.Â So when there is a big difference in the price of a flight to Belize vs. Cancun, we evaluate the longer route. In particular, I really appreciate being able to take the speed boat directly from downtown San Pedro to Chetumal.Â It only takes 1 Â½ hours and is about $60 US roundtrip.Â The time spent in immigration and baggage checks is nominal, as compared to stopping at the border.Â When you arrive at the dock in Chetumal, there is a dedicated group of Mexican agents there and things move pretty quickly. YouÂll find taxi cabs at the boat dock, ready to take you to the Chetumal bus terminal.Â Comfortable first class buses regularly leave for Tulum, Playa del Carmen, and Cancun in intervals of about every 2-3 hours. 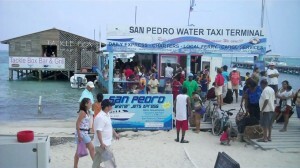 You can also buy the bus ticket in San Pedro, at the water ferry office.Â That is the easiest way to go, so you wonÂt have to speak Spanish to buy your tickets. We flew to France recently, for a special vacation.Â The best priced flights I could find were on British Airways, leaving from Cancun.Â European airlines arenÂt currently flying directly to Belize City.Â They supposedly will fly directly to Belize within a few years.Â The cost of our bus tickets were an extra $30 when charged in Belize.Â The last time I traveled they were about $22 when purchased at the bus terminal in Chetumal. We stayed at the Cancun Airport Marriott the night before our flight.Â The shuttle from the Marriott to the Cancun airport is free and runs regularly.Â It is about $80-90/night to stay at the Marriott.Â The hotels in Playa are less expensive.Â But I prefer to be very close to the airport when flying overseas. On our return trip weÂll again stay at the Marriott, mainly because we get into the Cancun airport around 10 PM at night.Â The next day weÂll decide what to do.Â But there are buses leaving Cancun, and Playa, going west, every few hours. Many of our friends who live in Belize regularly use this alternative Cancun route for travel.Â The bus is very comfortable, although they do tend to crank up the air conditioning.Â It does have a restroom on board. And the bonus is that itÂs easy to make a quick dayÂs shopping stop somewhere at one of the larger towns in Mexico to hit a Wal-Mart, Costco or Sams.Â Personally, IÂm happy we donÂt have a lot of shopping malls and chain stores in Belize.Â ThatÂs part of the charm of this country.Â Most stores are Mom & Pop owned, so you get to know the owners.Â But at times we do all crave a good old North American Costco shopping spree! 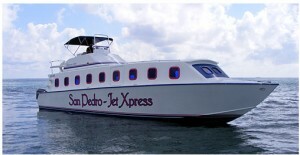 Note that Water Jets Express is the authorized agent for ADO bus service to Cancun. ADO is the preferred bus company to use when traveling through Mexico to Cancun.Â Be sure to purchase a high end ticket on the luxury bus.Â It is still very reasonably priced.Â The cost of the ticket from Chetumal to Cancun will be between $20-30 US/person, depending on the currency exchange rate, and the markup on the ticket.